Cx Associates served as both the Commissioning Authority (CxA) and LEED Consultant for the new Academic Facility at the CCV campus in Winooski, VT. The building recently received a Vermont Green Building Network Going Green Award because its energy use is proven to be less than half of the regional average for commercial buildings on an annualized per square foot basis. This 65,000 square foot facility uses only 48,000 BTU/SF/YR while serving over 2,000 students throughout the year. Cx Associates kicked off the project's sustainability work by facilitating two charrettes garnering important input on the project objectives from students, teachers, administrators, building operators and the design team. The group established a series of broad sustainability goals and the team worked to incorporate them into the design. Cx Associates assisted the team in aligning the goals with LEED Credits and ushered the project through the LEED process to a Gold Certification. One noteworthy outcome of the initiative was an open central stair with inconspicuous elevators to encourage occupants to use the stairs. The project included comprehensive commissioning which helped to ensure the systems were designed and installed to satisfy project goals for energy efficiency and individual control to every classroom. The Academic Facility on the Community College of Vermont Winooski campus is a good example of how the commissioning process works to bridge the gap between energy efficient building design and as-built building energy performance. As LEED Consultant, Cx Associates provided consultation and collaborative management in the planning and documentation necessary for the LEED certification process. Originally seeking a LEED Silver certification, in 2011, the building was awarded a LEED Gold certification by the GBCI. The facility incorporates water-efficient landscaping, extensive daylighting, and sustainable building practices that optimize the site, construction resources, indoor environmental quality, and operational resources. One key aspect of the building siting is access to public transportation. 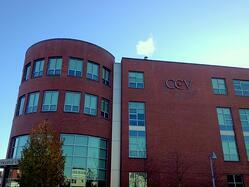 Cx Associates played a critical role in bringing the new CCV-Winooski building to fruition. We spearheaded the LEED certification from concept through Gold Award and we lead a rigorous commissioning process that helped the team succeed in delivering this high performing project within budget. A model of sustainable building and design, this facility is also an important part of the revitalization of downtown Winooski.